Security has always been the top priority for any business, ranging from SMBs to large-scale enterprises, Without knowing the root causes, and lack of skilled security experts, management of security issues are very difficult. 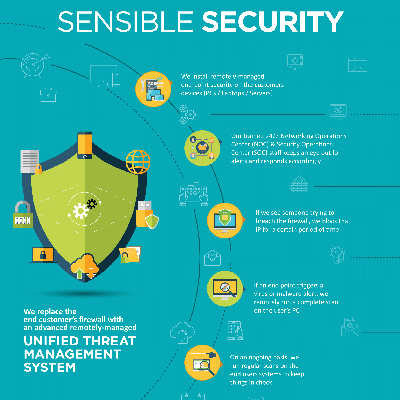 CoreIT Sensible Security and UTM solution provide 360-degree protection against all threats with 24/7 monitoring from our supported team. 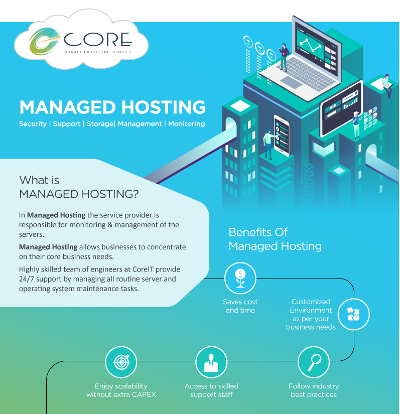 CoreIT understands that reliable Managed Hosting services are must to ensure that business remains competitive always. Therefore, our hosting model provides business agility, quality support, and guidance to follow compliances in a most cost-effective manner. Our customized managed hosting services ensure enterprises to focus on strategic business goals while we cater your business needs. Management of IT infrastructure is a challenging task and is becoming tougher with the innovation and complexities involved in it. 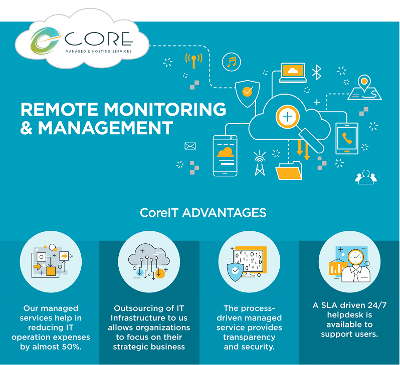 CoreIT RMM services facilitate streamlining IT operations through cost-effective methods and improve performance efficiency. Our competitive support team is successfully managing IT infrastructure across global ecosystem.